The Faithful Friends are 18", soft-body play dolls made by Heidi Ott, a Swiss doll artist, that were distributed by Target stores in the late 1990s. 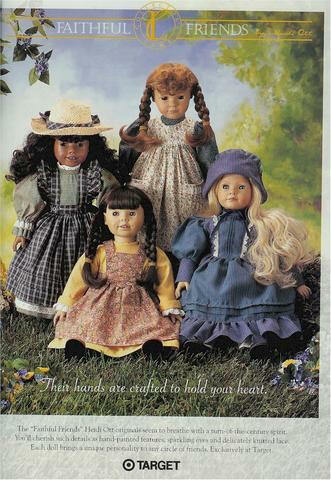 Like American Girl, the dolls were also the protagonists of historical fiction books. The four books are set in the year 1896 on the Illinois prairie. In them, we meet Ellie, an African American daughter of a preacher, Beth, a wealthy girl, Maggie, the tomboy who wants to play baseball, and Hannah, a shy girl who lives on a farm. On the right is the cover of "Meet the Friends", the first book in the series. The dolls were also found under the name of Best Friends in the beginning, before the books were published. At that time, the names and hair/eye colors of the dolls were less well-defined and you could, for instance, find a brunette Beth even though she is later found only as a blonde. The dolls were well received and well covered in the doll press: Benjamin was a 1997 DOTY (Doll of The Year) winner, Maggie made the cover of Doll World magazine in June, 1997 (first page of the article shown to the left), there was an article in the May, 1997 issue of Doll Reader and Maggie was a cover girl again for the June/July, 1998 issue of Doll Castle News. The quality of these dolls is quite amazing considering the price (under $30). 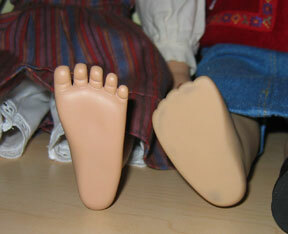 The sculpting is exceptional, not just of the face but also of the wonderfully detailed hands and feet. (In the picture below, you can see the difference between the Faithful Friends foot on the left and the AG foot on the right.) The vinyl quality is the best and the materials that make up the cloth body are sturdy and will last forever. The clothing for the dolls is similarly high quality. 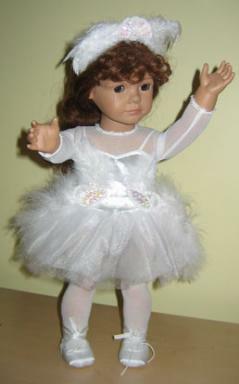 The materials, multiple layers, great shoes, lack of velcro, and great detailing are far above the norm for play dolls. The dolls did not have one single "Meet" outfit -- instead, they could be found in different Series which went from 001 to 007, like the Holiday Collection 007, where they are dressed for Christmas. None of the outfits are modern, however, and the girls always wore clothing appropriate for their American prairie girl heritage. A fair amount of American Girl clothing fits them fine, but pants and shoes are particularly a problem. Short sleeve/sleeveless or short pant length outfits also look a bit odd on them because of the cloth that extends down past their shoulders and hips. 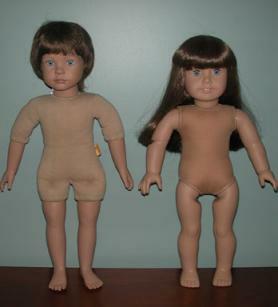 These were the first play dolls that Heidi Ott made and the first that were made in China and not handcrafted. She wanted her dolls by be enjoyed the mass market, not just those who could afford her similarly-sized $200-$600 handcrafted dolls. However, when Target began marketing them in ways she objected to, she terminated the relationship and sued. Heidi Ott eventually won the suit but not until after a bitter fight. After this, she sold the dolls herself under the name of School Children and later Play Dolls. They were given different names, better wigs and were available in more variations (and now costing $79). Since 2004, Heidi Ott no longer sells this type of doll, focusing instead on her extensive line of miniatures. If you collect 18" vinyl play dolls, be sure to track down a Faithful Friends doll (or three) for your collection. They are still readily available on eBay, often mint in the box, and the prices are very reasonable. They are a wonderful, affordable way to own a piece of Heidi Ott's artistry.